One picture and a little memory of recent history is all you need. This is a current screenshot from the ECB website where the money printers in Frankfurt try to justify their existence with achieving the ECB's mandate to hold long-term inflation "close but not below 2%" according to its statutes. This maybe a nice blue straight line keeping everybody well salaried at the ECB, but the long-term trend is most worrying. pre-Euro: 18 years of descending inflation after the records seen in 1981. 2007: Pinpointing the beginning of the crisis to August 9, 2007 with the first rattles in US subprime loans and the ensuing cognition that Europe's banks had bought too much of these crap CDOs (Collateralized debt obligation) ignites the fireworks of special central bank operations to prevent a contagion. 2011: We are one step away from the disintegration of the Euro. 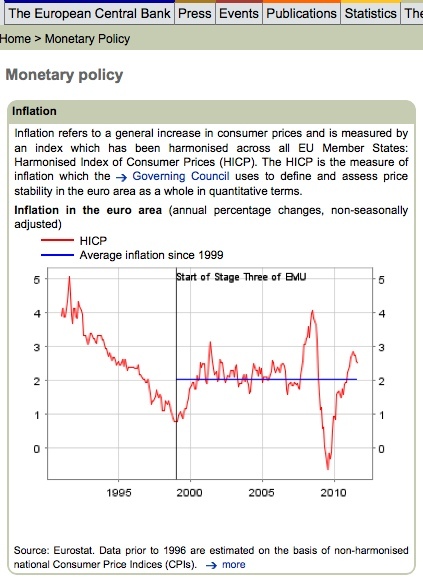 Screenshot from the ECB website, revealing a worrying inflation trend. Mind you, it was only one Lehman event that brought a spike in inflation on us. Central bank policy traditionally has a time lag of roughly 6 months before leading interest rate changes trickle down to the consumer level and it is now clear that the ECB's first baby step from 1.25% to 1.5% is too little too late. Don't bet on a quick ascension of consumer prices too soon, though. The world faces a global margin call where everybody will look for the cash exit, initially sending prices of all asset classes and commodities down. This period will morph into fears that the accompanying credit contraction will lead to a sharper recession than the mainstream is expecting now. But the inflation bull has long left the barn and it will not caught again by the ECB, simply for the reason that this supranational central bank will not exist much longer in its current form. In its 12 years all the ECB has managed was a tripling of inflation. Jean-Claude Trichet, this only deserves an F in the US system and a 6 in Germany. Stand up to stand down. Well i’m with Ireland, and then all through Ireland in europe bono plus the lads are generally definitely appreciated along with would not complete honestly a lot misguided, we all like these guys.